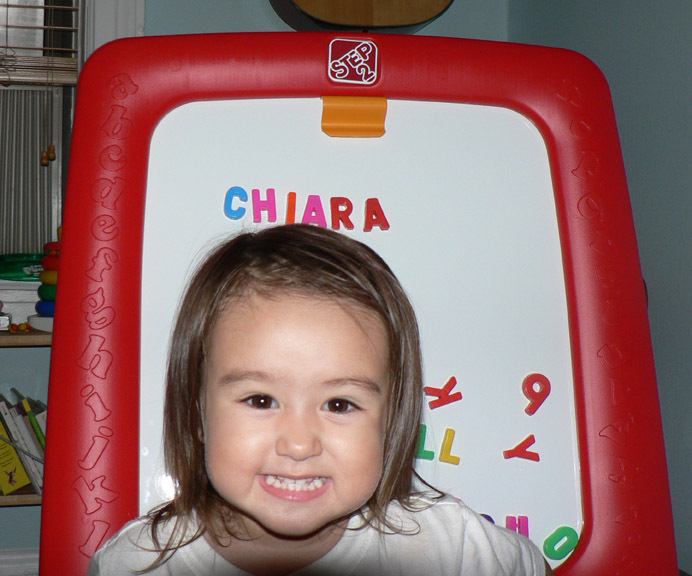 Chiara is two years old! Little Miss Chiara had two birthday parties, each a wonderful celebration with family and friends old and new. The first party was the evening before her actual birthday because I thought a celebration on Labor Day itself would be a traffic nightmare for people coming down to our Point Pleasant Beach house by car. A bunch of friends spent the day with us at the beach, and then came over to our house for pizza and birthday cake. I stood behind Chiara as our guests sang Happy Birthday but our friend Zak, who faced her, said that he watched as the recognition lit across her face that everyone was there for her and was singing the song for her. She was so excited after that that she woke up a few times during the night, mumbling about things that happened during her day, I think. I saw that she was awake at the exact moment of her birth so I nudged Luke awake too and we whispered a Happy Birthday song to Chiara at 2:42 am on Sep 3. So sweet! About a half hour later, she awoke again, or perhaps was just talking in her sleep. She said, clear as a bell, “I am sooo cute!” And then immediately fell back asleep! On Sep 9, we had a picnic in Central Park. What gorgeous weather we got again. The weather report called for a chance of thunderstorms so I’d been on pins and needles for a few days, especially since I had no back-up plans if it were to have rained. This time, we located ourselves on the grass under the shade of a bunch of trees and then the kids and parents went back and forth to the playground just steps away where there was a sprinkler, swings, slides, a rope jungle gym and all of this was in a huge sandbox. Fun! So the kids didn’t actually interact all that much, but they all seemed to enjoy themselves. I am looking forward to the day when Chiara does actually play with another kid for more than a few seconds, and perhaps without hogging all the toys!